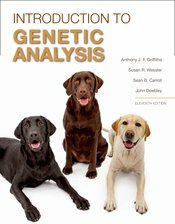 With each edition, An Introduction to Genetic Analysis (IGA) evolves discovery by discovery with the world of genetic research, taking students from the foundations of Mendelian genetics to the latest findings and applications by focusing on the landmark experiments that define the field. With its author team of prominent scientists who are also highly accomplished educators, IGA again combines exceptional currency, expansive updating of its acclaimed problem sets, and a variety of new ways to learn genetics. Foremost is this edition's dedicated version of W.H. Freeman's breakthrough online course space, LaunchPad, which offers a number of new and enhanced interactive tools that advance IGA's core mission: to show students how to analyze experimental data and draw their own conclusions based on scientific thinking while teaching students how to think like geneticists.